What can a Rutgers M.B.A. do for your career? Earning your M.B.A. from Rutgers can lead to new career opportunities, higher salaries, and a strong ROI. In addition, you will have access to great career services and job placement assistance. Rutgers’ M.B.A. offers a 169% return on investment (Bloomberg Businessweek). Look at the average compensation below and think about that year over year. Then compare it to the competitive cost of our M.B.A. program. You don’t need your M.B.A. to appreciate the value of a high ROI. 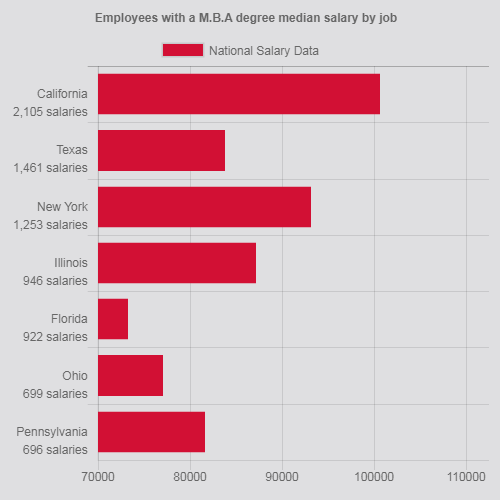 Average salary with an M.B.A.
What do employers look for in an M.B.A. job candidate? When you put an M.B.A. on your resume, it means something. When you put an M.B.A. from Rutgers on your resume, it means everything. Employers respect Rutgers as one of the most distinguished institutions of higher learning. Graduate from a top-ranked business school accredited by the Association to Advance Collegiate Schools of Business International (AACSB). Learn to make knowledgeable decisions and become a respected leader. Increase your influence by employing management skills to guide your team and company. Better analyze problems and clearly articulate effective solutions. Expand your network and connect with notable Rutgers alumni, classmates, and faculty. AACSB accreditation is known worldwide as the longest-standing, most recognized form of specialized/professional accreditation an institution and its business programs can earn. Build expertise in your career area with Focused Learning Modules. Choose from Business Analytics, Digital Marketing, Investments & Private Wealth Management or Strategic Leadership.